The Barrett brothers’ journey is not to be a smooth one. A ninety-year-old bachelor farmer with a game plan of his own threatens to disrupt and delay the will's mandatory expedition. A neighbor rancher, using a gullible hometown sheriff and a corrupt local politician, seeks to thwart their plans and seize the property. In this turbulent novel, the Platte River—a mile wide and an inch deep—becomes its own character and lives up to its legend of being too thick to drink and too thin to plow. 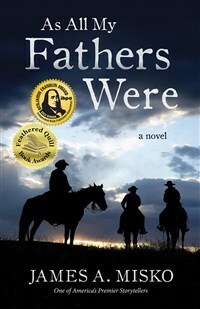 "In this tough but tender story of two estranged brothers—and their event-filled trek down Nebraska's Platte River—Misko simultaneously paints a memorable portrait, as incisive as it is illuminating, of America's disappearing past and its increasingly conflicted future." —Two aging brothers, set in their contrary ways. —One odyssey by horseback and canoe through their family's past, with a crucial deadline to save their heritage. —'Good ol' boy' villains conspiring to make them fail. —A conscientious author who knows the territory. —Stir in saddle sores, exhaustion and suspense, and serve at just the right moment. "As All My Fathers Were is a refreshingly unapologetic, environmental polemic—one with living characters and a pulse. But far more remarkable than the story of two Nebraska farmers on a quest to save their land, is its author: an 80-something self-described gun-toting political conservative. Jim Misko’s condemnation of modern agribusiness bares an essential truth: Nature knows no politics, and we’re all in this together. Off in the distance, you can hear Edward Abbey, Rachel Carson, and the Platte River itself applauding."